Experimente a atmosfera elétrica de Santiago depois de escurecer neste passeio noturno de 4,5 horas abastecido por coquetéis. 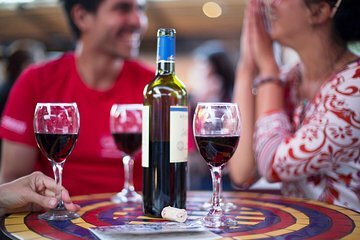 Conheça os melhores lugares para beber, dançar e jantar ao explorar o animado bairro de Bellavista, em Santiago, com um guia local. Hop entre bares e discotecas, onde pode dominar alguns movimentos locais com uma aula de salsa, provar bebidas populares como "Piscola" e saborear petiscos típicos como "Sopaipillas con Pebre". Uma vez que a turnê acabar, fique por perto para festejar nas primeiras horas com seus recém-chegados amigos bebendo! This is a must if you are new to the city. You will see all the best sights near the center of the city very close to the Moneda. My tour guide Laura was amazing. She was warm, friendly, and worldly and had great repertoire with the locals we visited. You will interact with many locals on this tour, taste yummy food, and sample authentic Chilean drinks including the Teremoto and Pisco Sour. This is the best way to discover real gems in multiple neighborhoods in a single swoop. What a great way to scout the neighborhoods for later excursions. I highly recommend.